This is an honest book, in all kinds of ways. First and foremost, it is an honest book about how to catch pike with lures, based on personal experience and a great deal of trial and error. Too often, ‘how to’ books leave you with the impression that you are being lectured to by some kind of minor god who has never made a mistake and has condescended to descend to earth purely in order to save you from the error of your ways. Chris is no god - that is the second part of the honesty. Fishing and Pike Lures begins an insight into why the book was written at all, and it is the sort of insight that few of us would be honest enough to make public, were we in the position of having the option to write it. In my profession I have watched far too many good people go to a hell of their own devising, and it is refreshing, for once, to watch someone who has decided that they don’t need to live there any more. So there is a bit of experience lying behind this book. It gives it an edge, there is no doubt about it. 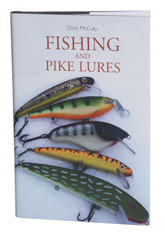 What you get are 270 odd pages on how to catch pike on a lure and I guarantee that by the end of it, you should be able to go out and buy the correct tackle to go out and fish for pike on water near you, confident that you are using the right gear. This book is made all the more valuable because Chris draws on the experience of Dutch pike specialists, knowledge that is generally denied to us because it rarely appears in English magazines. Collectively, the Dutch probably know more about pike than any other nation and Chris gives a remarkable insight into the methods they use. Someone once described Chris as a writer who does a bit of fishing. Well that is as maybe. But this is a real jewel of a book and I wish Chris had written it a long time ago.